The NHS had sprung into action, called up a couple of players and as a consequence, reduced the field to ten. Many regulars were joined by several players visiting Fylde for the first time. Steve calmly proceeded through each game scoring 5/5 while overcoming some peculiar weather on Saturday. I am sure other reports from around the country on this weekend will mention the elements. In fact Blackpool escaped the worst of it. Players were given enough Sunshine to dry off before the next dousing. In the final round, by winning, Steve held of the challenges from serial winner John Henderson (Penrith CC) and in another game Alan Morton (Fylde CC) who otherwise would both have had a chance through the tie break. Bars, BBQ’s, Beech Chairs ‘n’ Balls – yes it’s another Corporate Croquet Event brought to the NW by James Hawkins on behalf of the CA. 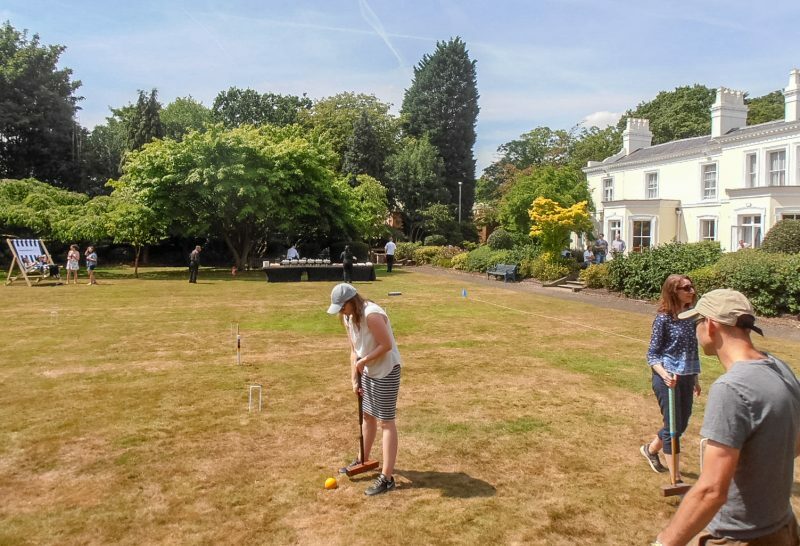 Fifty Five Physicists and Engineers from Manchester University wanted a team building ‘get to know you’ event so of course Croquet was deemed the way to enable new friendships to form across the scientific field divide – clearly none had come across this sport before! Three courts were created behind the hotel and battle (friendship) lines were drawn with four players thus assigned to each (usually 2 from each area), they were introduced to basic GC laws and allowed to ‘crack-on’, first pair to score 4 points *wins* match…. and another session/match..and another…etc. Many Rotations later, such was the intensity of the competition, that after one really bad ‘flubbed’ stroke, a player broke the offending mallet in frustration – and quickly offered to pay for the damage somewhat red faced. 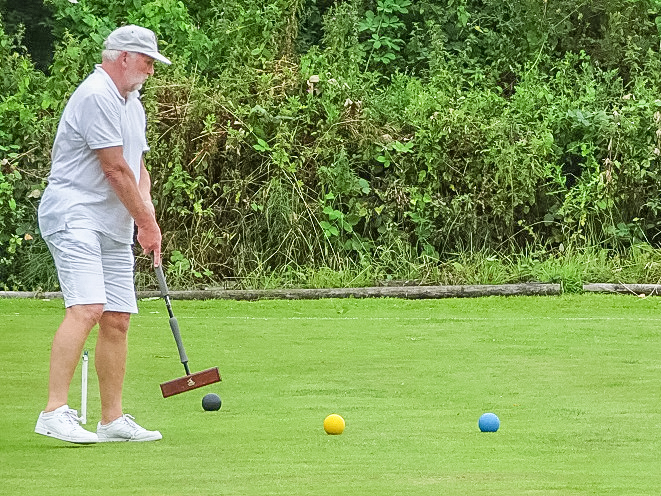 After four hours of this play, most declared that Croquet was *Fun* – who knew? Scorching HOT sunshine and a very fast playing surface welcomed players to Bury Croquet Club for this inaugural ‘C’ level Golf Tournament. The majority of the players present were playing in their first ever CA scheduled Tournament and it soon became evident that each one of them had arrived with every intention of winning and attaining automatic entry into the National final which is to be held in Nottingham during September. David Cornes from Crake Valley, celebrated his recent appointment as a qualified Tournament Referee by overseeing play throughout the day. His presence proved invaluable to the players and Tournament Managers alike with his helpful and constant attention whenever required. The fast lawns enabled long clearances and hoop shots. It soon became apparent that Izzy Poyntz from Bishop Monkton was using her prowess and strong hitting to successfully remove her opponents balls to the side lines whilst she herself scored a succession of good hoops. Meanwhile steady, but slower, progress was being made by Richard Leach, Gill Freely and Roger Harper from Bury, as they each tried to challenge the high number of wins being achieved by Izzy. When all the rounds had finished, however it became abundantly clear that Izzy had won all her games, including beating her nearest challengers and she therefore stormed into the Semi-Finals. At this point, the extreme heat of the day must have had a different effect on the four semi- finalists because two players improved their concentration immensely and also improved their play, whilst the other two wilted in the sun. The number of wins had brought Izzy against Gil and Richard against Roger for the semi’s. From these games , it was Gil and Richard who then progressed into the Final. The final itself proved to be an extremely hard fought match with lots of excitement for the spectators with several wonderful shots that brought cheers from the crowd. In the end it was won by Richard Leach 7-4.